Can't attend? Follow sub:shaman to know of future events! Presale tickets on sale until May 12, 11pm. 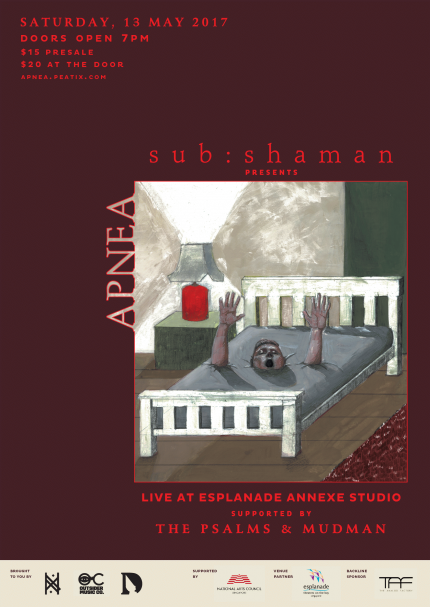 Singaporean alternative band sub:shaman are proud to announce the launch showcase for their debut full-length album Apnea, at Esplanade Annexe Studio on May 13th 2017. Supported by National Arts Council, Esplanade, and The Analog Factory, the launch showcase will see the band perform their debut album in its entirety for the very first time, just a day after the album’s highly anticipated worldwide release on 12 May 2017. The album launch showcase will feature dramatic visual projections by long-time collaborator, Marc Gabriel Loh as he responds to the band’s live performance. The showcase will be supported by two exciting local bands, The Psalms and Mudman, who will be making their debut live performance. If you can smell satay from Gluttons Bay, you're just a minute's walk away.